Effective against immature and mature flukes, larval stages of Oestrus ovis (sheep nasal bot fly), and inhibited, immature and adult stages of Haemonchus contortus, including benzimidazole resistant strains. Ticks (Ixodes ricinus) feeding on sheep at the time of treatment are likely to producte fewer viable eggs. Off-white to slightly yellow oral suspension containing equivalent of 50 mg closantel per ml (as closantel sodium dihydrate). Ticks (Ixodes ricinus) feeding on sheep at the time of treatment are likely to produce fewer viable eggs. 1 ml of Flukiver per 5 kg bodyweight (i.e. 10 mg closantel per kg bodyweight). Give orally as a drench. Suitable for use with most types of standard drenching equipment. Shake well before use. Do not mix with other products. All sheep on fluke-infested pasture should be dosed at regular intervals during the fluke season (Sept–Mar). Regional fluke forecasts from NADIS assist in the choice of dosing time and interval. For the treatment and prevention of benzimidazole resistant and susceptible H. contortus, dose at lambing to help prevent pasture contamination by infected ewes. Treat all animals at 6 weekly intervals during high risk periods in summer and autumn. •Too frequent and repeated use of anthelmintics from the same class, over an extended period of time. •Underdosing, which may be due to underestimation of body weight, misadministration of the product, or lack of calibration of the dosing device (if any). Resistance to closantel has been reported in Haemonchus outside the EU. The use of this product should be based on local (regional, farm) epidemiological information about susceptibility of nematodes and recommendations on how to limit further selection for resistance to anthelmintics. When using a drenching gun, take care not to injure the mouth or pharynx. Not authorised in ewes producing milk for human consumption including during the dry period.Do not use within one year prior to the first lambing in ewes intended to produce milk for human consumption. Symptoms of acute overdosage are decreased vision or blindness, anorexia, incoordination and general weakness. The time between withdrawal of the first and last doses from the container should not be unduly prolonged. Do not store above 25 °C. Protect from light. For animal treatment only. Keep out of the reach and sight of children. 1 L, 2.5 L and 5 L plastic flexipacks. 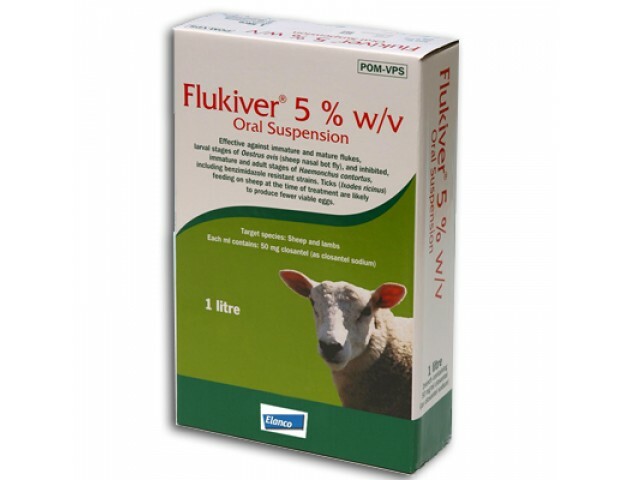 Flukiver can be used in all age groups of sheep and lambs. It can also be used in rams at any time including during the breeding season. It can be used at any time during pregnancy. Below are some recent questions we've received regarding Janssen Flukiver Oral Suspension, including answers from our team.